The determination of appropriate action plans is a key task for industrial managers. This task is essentially complex as it requires an understanding of the relationships among many variables. The relationships between objectives and variables in a given industrial situation are usually not available to managers in the form of scientific laws. Rather, they are discovered, defined, and labelled by managers who use an implicit understanding of the operating environment to make sense out of them. Based on a successful three years' PhD research, we have demonstrated that a central component in this ‘implicit understanding’ is a mental visualisation that links together many variables. The use of such a visualisation permits managers to have an overview of the situation. In this way, it becomes possible for managers to devise co-ordinated action plans which contribute to the achievement of the objective. We have developed a software tool (TAPS) to assist managers in linking business strategy to action plans. 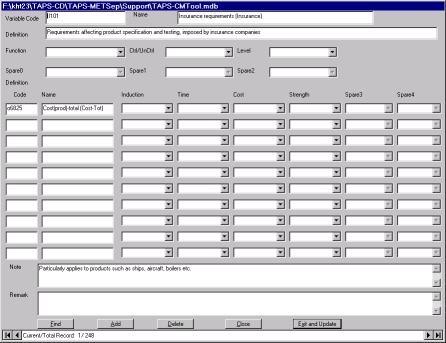 TAPS was developed using Visual Basic and adopted the Connectance Concept (Inductive rule) and Analytic Hierarchy Process (AHP) as its operating principles. The tool has been tested and applied in several multinational corporations to address strategic operational concerns. TAPS is a qualitative modelling tool which facilitates high quality logical discussions leading to clear and compelling actions by the managers. TAPS helps managers to understand the relevant variables, identify the main drivers and select which action to adopt. It provides the ability to capture and communicate the essence of a problem in an easy to understand manner. 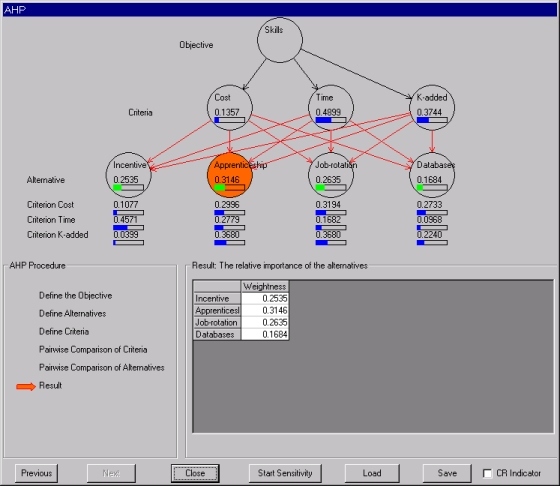 TAPS has interactive features allowing managers to develop a hierarchical model. TAPS allows the model of the problem area to be developed alongside, and at the same time as, the thought process of the managers. The building of a variable network allows information to be assessed and shared, so that the ideas and beliefs contained within the model can be altered or modified at will. TAPS has built-in functions called ‘Trace-Down’ and ‘Trace-Up’. Trace-Down is an analysis to determine the effect of a given direction of change in one variable on other variables in the model. Trace-Up analysis, starts with a desired direction of change in a variable and works back to find which other variables have to be changed in value and in which direction. These functions allow a user to perform an analysis on any variable in the model. TAPS has a built-in AHP decision support tool to assist managers to prioritise the identified actions for further execution. In light of the success of this research, we would like to look for suitable partners to help us in commercialising TAPS as a strategic decision support tool. We are flexible on the form of collaboration and welcome further discussion. If you are interested please contact us. TAPS was developed with cases involving industrialists, consultants, and academics. Example of applications and potential uses highlighted by industrialists can be seen below. Like many other multinational companies, the producer was faced with several challenges, a key one being to improve factory performance. Different factories all over the world have different operations performance and there was no common understanding of which were the key drivers which needed to be improved in order to achieve greater factory performance. Moreover, existing managers based in the corporate office were from various countries and had different management experience and perspectives on what drives performance. TAPS was used to the company to develop a ‘global factory performance’ model. The purpose of the model was to build a consensus among the managers on the variables that drove operations performance, as well as to assist them to identify the key operations performance drivers. From the model, action plans for improved operations performance were identified. A global operations model that could be customised to different depths to suit management requirement in different countries. Recently the company had been looking into manufacturing operations with an aim to reducing operating costs. The company had launched a study to look at how to design and build a factory quickly. The factory design should be easy to build and flexible enough to be customised to accommodate potential future product ranges. A project using simulation tool to identify main drivers for factory life cycle cost had failed to produce a satisfactory result. A factory life cycle cost model was developed using TAPS. 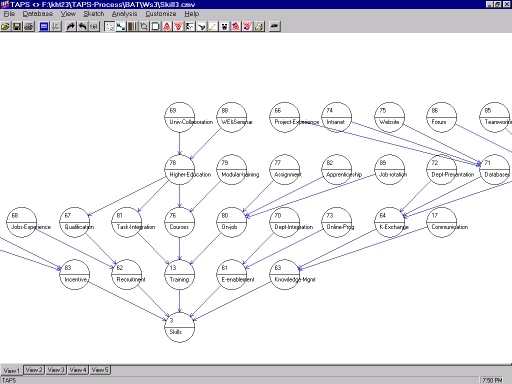 From the model, the impact of each variables on life cycle cost was gathered, analysed, and stored in the built-in database function. 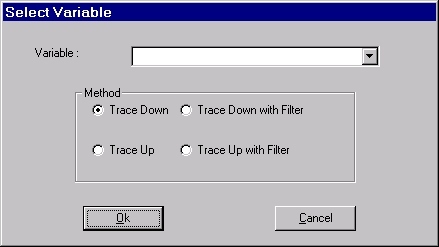 Using the Trace-Up and Trace-Down functions, a set of drivers was identified. The final evaluation process was performed using the AHP decision making approach. TAPS can facilitate main drivers identification and selection by providing intuitive graphical displays of a problem structure, filter functions for managing complexity, an integrated database to store knowledge about variable relationships and a hierarchy model for decision analysis. Forecast increase in demand prompted the company to look into increasing its existing plant capacity performance. The director knew that the existing packing plant capacity was not performing well and he wanted to find a solution which would increase capacity utilisation. Over the years, a number of initiatives set-up with consultants had achieved only piece-meal results. TAPS was used to assist the management team to have an in-depth understanding of the capacity problem. A model linking capacity performance to variables, improvement actions, and management tools was developed. The TAPS model helped the team to visualise the scope of action plans that could be muscled to address capacity issues. The TAPS approach recognised the importance of assisting the evolution of the managers’ ability to deal with the problems confronting them through increasing their understanding of the relevant variables. It provided models of the environment from which managers can develop insights into the effects of their decisions on progress towards the goals that they wish to achieve. Moreover, TAPS allowed the model of the problem area to be developed alongside, and at the same time as, the thought process of the managers. A project was undertaken to study the suitable technology that will improve operations performance in the postal services, with the aim of generating higher revenues. The company had sought helps from a number of different external parties and subsequently identified a vast range of technologies to improve their operations. However, they were facing difficulties in studying the interrelationships between the technologies and its impact on revenue generation. TAPS was used to assist the company to build an operation model, linking various technologies to revenue generation. TAPS analytical function was then used to establish the impact between technologies and revenue performance. A number of action plans for greater revenue generation were also identified. A technology roadmap on revenue generation. The TAPS model ensured a clear communications and a shared understanding of the technology issue. The company had been looking into ways to reduce operations costs for over a period of time. Many exercises had been initiated but failed to provide satisfactory results. The company wanted a structured process that could assist them to increase both the depth and breadth of participation in the discussion of cost improvement issue. TAPS was used to assist the company to develop a six-levels cost model. The model enabled the team to have a clear understanding of the relationships between cost, aspects of cost, variables, actions, and management tools and techniques.The model also served to build a collective understanding among the management team on the variable that drove manufacturing costs, as well as to assist them to identify the key cost drivers. From the model, action plans for reducing operations costs were further identified. The variable network building process enabled everyone to have their knowledge brought into the open and their assumptions challenged. Managers agreed that this process was useful to enhance their understanding of an issue, as well as to facilitate organisational learning. Moreover, the TAPS process assisted in avoiding individual ‘experience bias’ in making decisions.